Eating street meat from a street food cart is a veritable rite of passage in NYC. But there's one cart that reigns supreme above all others, and that’s Halal Guys (officially named The Halal Guys). A bona fide institution with over 25 years of street meat experience, you can thank The Halal Guys for mainstreaming halal carts in a way no one thought possible -- seriously, even the guys who started it are pretty shocked. We sat down with these kings of the corner to get all their delicious secrets, and we’re pretty confident you’re gonna need a gyro coated in white sauce after reading this. Before dominating the halal scene, founders Mohamed Abouelenein, Abdelbaset Elsayed, and Ahmed Elsaka ran a hot dog cart out of their founding corner on 53rd St & 6th Ave. But the three quickly realized that there was a strong demand from cab drivers for convenient halal food that didn’t involve driving to Astoria, and thus The Halal Guys (THG) was born. You might not have even been born yet, but back in 1990, there was no internet. So to develop any sort of following The Halal Guys had to rely on word of mouth, and luckily the cab driver community did just that. Whenever tourists asked their cabbies where to go eat, they often suggested The Halal Guys, and this promotion helped foster an initial fan base. 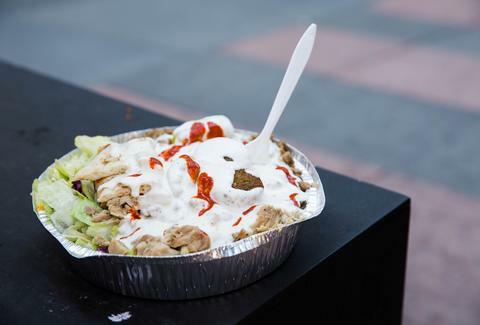 The Halal Guys aren’t spilling on their famous white sauce recipe any time soon, but seeing as it’s been practically unchanged for 25 years, they know they’ve got a good thing going. We even tried to crack the ingredient code (and it kind of worked). They’ve got restaurants, too! From the UWS to 14th St to Long Island City, The Halal Guys are expanding their brick-and-mortar operations at a rapid pace. And not just in New York -- last year, The Halal Guys expanded to Chicago, LA, and even the Philippines, and that’s just the beginning. With over 350 locations in development -- seriously! 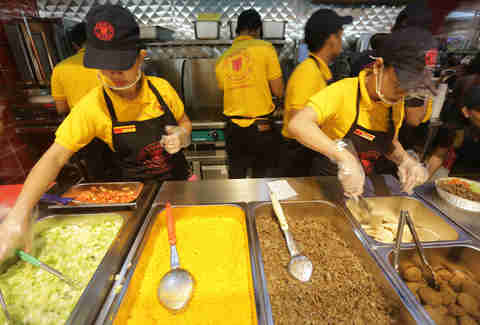 -- The Halal Guys are going global in a major way. It’s consistently one of The Halal Guys’ most in-demand orders, so much so that the Houston, TX location goes through over 600 pieces of falafel A DAY, which is a hell of a lot of chickpeas. Often referred to as the “Halal Classic” or simply “The Platter,” this beast of an entree is a chicken & beef gyro served over rice with lettuce, tomato, pita, and the world famous white and red (hot!) sauces. And that’s only because of street closures! Dedication, thy name be The Halal Guys. They hustled back into the city as soon as the streets were opened and were the only food available for blocks, so the lines were predictably insane. Even more amazing? 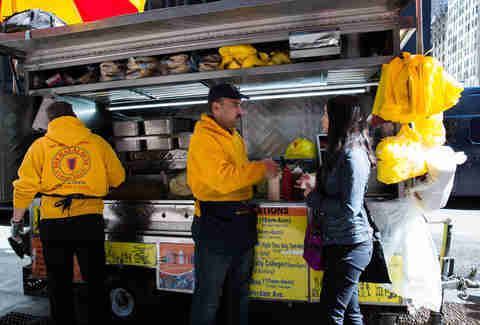 In the days immediately following the storm, all emergency workers/first responders ate for free. The combination of traditional halal ingredients and spices + an “Americanized” presentation (one designed to specifically meet the needs of the NYC cabbie community) has essentially become a genre of it’s own: American Halal Street Food. Technically they love everything on the menu, but when we pushed for specifics, we weren’t disappointed. For Mohammed, his go-to order is the classic combo platter; Ahmed is partial to the chicken sandwich for its on-the-go convenience; and Abdelbaset is also a combo platter guy, but WITHOUT the hot sauce -- it’s a little too spicy for his taste. In layman’s terms? That’s REALLY hot. As in hotter than a thai chile and twice as hot as a tabasco or cayenne chili, so proceed with caution. Christine Fischer is a freelance writer for Thrillist who ate The Halal Guys’ falafel platter every Friday in summer 2009. Follow her on her website, Facebook, or Instagram.